On the eve of Memorial Day comes news of the death of Howard Burling II. The former Westport police officer — who died last week in Trumbull, age 83 — was best known here for another holiday. Every 4th of July he would parachute onto the Compo Beach parking lot. His landing marked the unofficial start of the fireworks. Parachuting — one of Burling’s many passions — dated back to his Marine Corps service during the Korean War. He parachuted more than 2,000 times including onto the North Pole — at the age of 62. After the Marines — which after his discharge he continued to serve as a reserve officer — Burling joined the Westport Police Department. He spent 20 years on the force, retiring as captain. 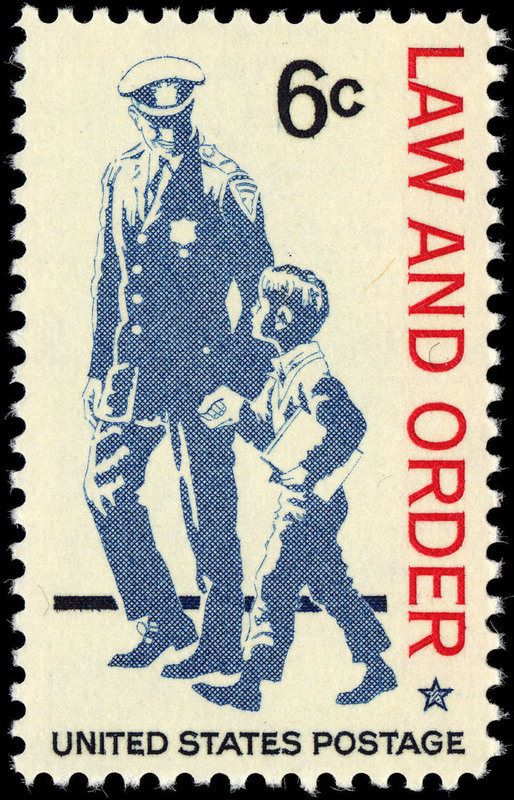 In 1968 he and his son Marc served as models for a U.S. postage stamp, celebrating the police officer’s duty to protect and serve. His legacy lives on in 2 others ways. An avid SCUBA diver, he started the department’s Underwater Rescue Team. 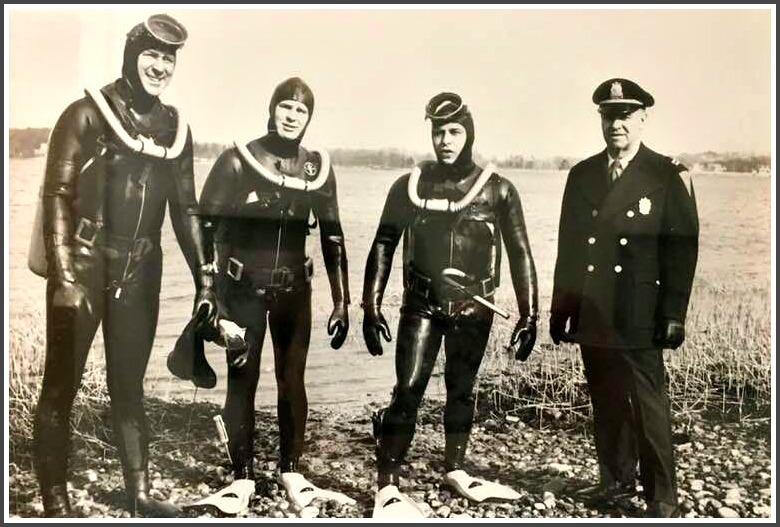 Howard Burling in the early years of the Westport Police Department water rescue team. 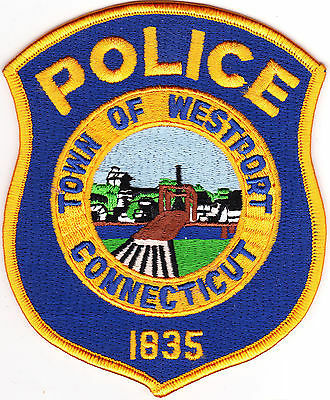 And Burling designed the Westport Police patch. It’s still worn today. In 1962 Burling — along with Westport YMCA director Matt Johnson, and Staples High School assistant football coach Chuck Smith — began the summer Road Runner race series. More than 55 years later, it’s still going strong. Burling is survived by his son Marc of Yorba Linda, California; grandchildren Charlie, Carina and J.D. ; daughter-in-law Marlene Burling of Seymour, and sister Jane Fraytet of Charlotte, North Carolina. He was predeceased by his son Ward Burling, and his brothers Charles and Walter. He is also survived by his ex-wife Emma Burling of Milford. They met in 1955, were married to each other twice, and remained best friends until the end. He was also close with his ex-wife Beverly Previs of Stratford, with whom he resided for the last 10 years. Burling will be remembered at a memorial service with military honors on Thursday, June 14 (Milford Christian Church, 989 New Haven Avenue, Milford, 6:30 p.m.). This entry was posted in People, Police and tagged 1968 US law and order stamp, Howard Burling. Bookmark the permalink. Worked with him at Centerbank in Waterbury for many years – he would parachute into our the bank’s summer picnic annually. I remember Howard from when he was a police officer, turned out in his flawless uniform. He had a terrific smile but you felt the serious man behind the badge. Westport was as safe as could be in the day but I had the feeling that if anything went wrong Howard would be there to take care of it, quietly and efficiently. I also remember him parachuting onto Compo Beach on the 4th of July… Exciting way to start the fireworks! Thank you Dan, for over and over again, taking us back to some of the glorious memories of Westport from days long past. I heard a story that he once boarded a commercial flight carrying on a parachute….just in case…..
As a child, the Westport PD was larger than life to me. Howard Burling was right at the top. The real deal. Dan, I know you’ve profiled many of “Westport’s Finest” over the years and a published compilation might be very well received. When I was a Westport News reporter at age 19, I did a feature story on Howard Burling, then a sergeant. I remember that “Likes Challenges” was part of the headline, and at that time he was involved in just about half the things you describe here. He was an extraordinary man, always upbeat, and for his help in creating the summer road race series, I obviously owe him a great deal.